In a Nutshell: With over 20 years specializing in the business of private, tailor-made travel in the northwest region of South America, Aracari offers native wisdom and insights to travelers seeking one-of-a-kind local experiences. Supported by the knowledge and expertise of Aracari’s travel specialists, explorers have the opportunity to engage in exciting adventures that offer in-depth experiences among South America’s most enchanting offerings — ranging from archaeological history spanning several millennia to a world-renowned contemporary culinary scene that dazzles modern foodies in the city of Lima, Peru. When traveling South America using your credit card rewards, look to Aracari to discover opportunities for intimate and exclusive local experiences. In the late 1990s, when Aracari Founder, Marisol Mosquera, left a London-based career in finance to establish a travel company in her home country, her goal was to offer high-quality, curated travel experiences that did not yet exist in Peru. Mosquera was a few years ahead of the curve in a region only recently recognized as a world-class destination for its culinary tourism, historical sightseeing at UNESCO Heritage Sites, and ecotourism opportunities. Aracari focuses on curating unique, luxury experiences that diverge from the mainstream. 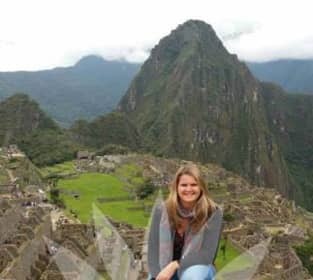 Caroline Major, Head of Marketing and Product at Aracari, visiting Peru’s famous Machu Picchu. “We strive to not just offer the bread-and-butter destinations that every guidebook offers. When we do offer those mainstream destinations, we’re looking to do it in ways others aren’t: for travelers to get exclusive, inside, behind-the-scenes access. We’ll provide a different depth of knowledge to the place that you’re visiting — so you can visit the same places, but they can be experienced in very different ways,” said Caroline Major, Head of Marketing and Product at Aracari. 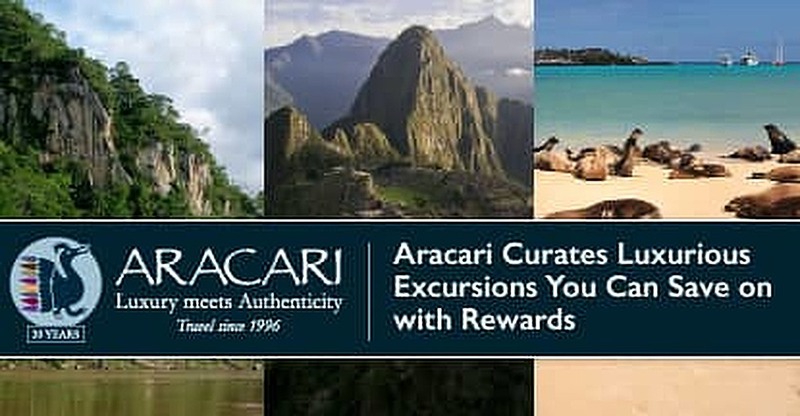 Aracari’s commitment to sustainable, curated luxury travel has earned the company numerous accolades, including the Positive Luxury Butterfly Mark for sustainable tourism, spots on the Travel + Leisure A-List and Wendy Perrin’s WOW List, and recognition in the Condé Nast Traveler, among others. For those traveling with Aracari, no two vacation experiences are the same. The company specializes in private travel, ranging from romantic getaways for couples to large, multi-generational family trips or special excursions for small groups of friends. “Groups come to us because they’re looking for true local knowledge; to be able to know that they’re using their time as best as possible, and getting the most out of their experience — whatever that may need to be for them,” said Major. “It could be more relaxing. It could be to have more educational insight; to meet more architects, historians, anthropologists. It could be a family looking to make the most of their time together: maybe to go off-grid, leave social media behind, and have a luxury camping experience,” she added. Major notes that travelers often opt for cuisine-centric luxury vacations in South America’s culinary capital, Lima, Peru, while others are more interested in strapping on hiking boots to explore the region’s eco-diverse great outdoors and pre-Columbian history. In either case, travelers can rely on Aracari’s wealth of local knowledge. Major recommends excursions to Peru’s Sacred Valley, Machu Picchu and Cusco: spots that are as rich in exciting activities as they are in regional history. “You have this amazing combination of Incan ruins, traditional ways of life, Andean villages, and loads of adventure activities: hiking, biking, stand-up paddle boarding, camping, zip lining, horse riding. There’s no shortage there for people who want to get involved in adventurous activities,” Major said. The region of South America where Aracari is based experiences rainy and dry seasons that often influence vacation planning. Major notes, however, that any time of year can offer excellent travel options because of the region’s diverse ecology. “There isn’t a totally straightforward answer to when is the best time of year to visit because you can definitely visit any time — it just depends on when and where you’re visiting,” she said. Using Peru as an example, Major explained that travelers to the region have an abundance of options to enjoy any time of year. 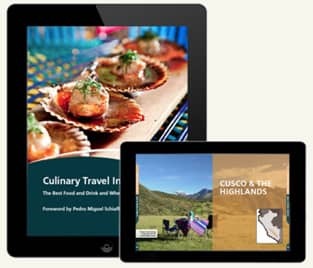 Aracari’s free Culinary Travel e-book is a fantastic launching point for travelers looking to get a taste of the best cuisine South America has to offer. She noted that modern-day Lima, a coastal city best known for its seafood, stands among the world’s top contenders in the culinary scene. “Lima is a cool and increasingly popular destination specifically because of the explosion in the gastronomic food scene and the array of gourmet restaurants. In the same way that foodies might want to go to France and Italy, Lima is that equivalent in South America — and sits on the same pedestal as a heavyweight food destination that can compete with, if not exceed, those types of destinations,” Major said. Perhaps Aracari’s greatest standout feature is its partnership with professionals in fields not specific to tourism: top chefs, anthropologists, local artists, and others, who offer their expertise to enhance what non-local travelers will experience in their trip. Whether it’s a tableside meal with the award-winning “jungle chef,” Pedro Miguel Schiaffino, at one of his restaurants in Lima, or an excursion to the ruins at Machu Picchu alongside Colonial Andean art expert and anthropologist, Lisy Kuon, Aracari’s network of specialists ensures a truly exclusive and intimate experience. “We collaborate not just with high-quality professional tourism guides, but also with specialists who come from fields outside of tourism, who can lend their expertise and specialty to the narrative of the trip. That can be sitting over dinner with a National Geographic expedition leader as they recount their tales of exploring unknown ruins, or, in Lima, for example, we arrange art tours where you’ll have tea or a Pisco Sour in the private home of a local artist while chatting about the art scene,” Major said. “These are the kind of characters who provide more color to the places you’re visiting,” she added. The benefits of arranging a trip through Aracari extend beyond simply getting a great deal on international travel with credit card perks. With Aracari, an excursion into the heart of South America’s most fascinating destinations is a once-in-a-lifetime experience that is enhanced by the combination of local expertise and luxury travel accommodations.